Angela is a faith driven financial professional whose focus is in the field of strategic charitable giving. She partners with our clients to understand their personal, philanthropic, and spiritual goals in order to provide them with customized solutions. She takes pride in her passion for helping families and individuals make their dreams become a reality. She does this by placing an emphasis on gaining insight into each clients' situation, values, goals and family dynamics to develop and execute a customized comprehensive financial plan. Angela and her husband, John, live in Rockford, MI with their two sons, Niko who is 3 and Easton who is 1. They enjoy spending time figuring out parenthood, traveling the world, and volunteering at Tribes Church. Angela loves reading, boating and fitness. 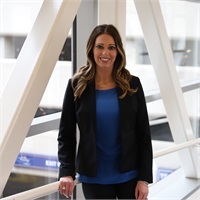 Angela graduated from Grand Valley State University with a Bachelor of Business Admininistration in Marketing and Management. Angela has attained her Series 7, General Securities Representative and 66, North American Securities Administrators Association (NASAA), Uniform Combined State Law licenses and also holds an Insurance license for Life, Accident & Health in the State of Michigan. Angela is currently studying for her Certified Financial Planner (CFP®).